14kt white gold, pink tourmaline and diamonds ring. The sophisticated styling of this ring will help you create an amazing allure. Crafted with polished 14K white gold, this ring features one MQ cut 12 x 16 mm pink tourmaline partially bezel set in the center of the dome top. There is a row of 50 round full cut diamonds in prong set along each shoulder. 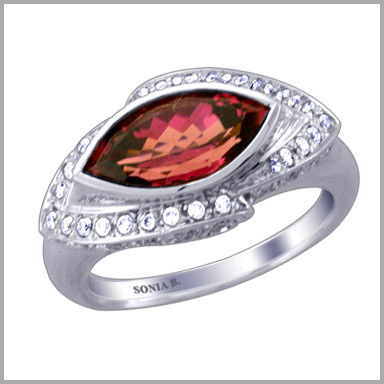 Tourmaline weight is 2.0700ct, and diamond weight is 0.63ct with G-H in color and SI2 on clarity.